Homemade applesauce is one of my favorite parts of fall. I love how it makes your whole house smell incredible while it’s cooking, and the health benefits are miraculous. Cozying up with a warm mug of homemade applesauce is something you don’t want to miss. Read on to find out how and why you should try making this homemade applesauce recipe- no sugar included! There are about a billion reasons you should be making homemade applesauce this fall. It’s super easy to make! 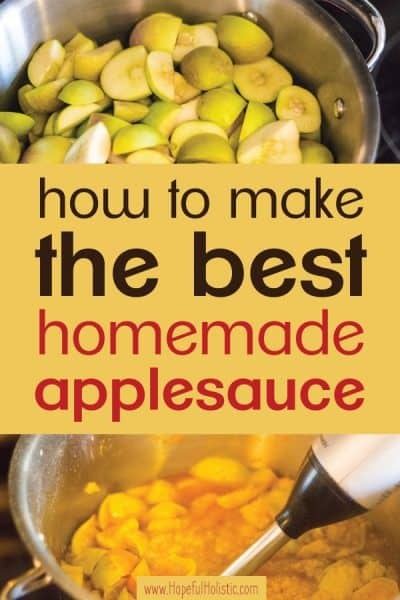 You can whip up a huge pot of homemade applesauce in about half an hour, depending on how fast you can cut up apples. Read on for a hack to help make your apple slicing go faster! It’s good for you. When you go to the store to buy applesauce, it’s usually packed with sugar, and probably preservatives, and who knows what else. It’s hard to avoid. Making your own homemade applesauce lets you make fresh, sugar-free applesauce that’s healthy! You can avoid plastic. This applesauce ain’t just healthy for you, it’s healthy for the whole planet! If you’re trying to avoid the toxins or waste in plastic, this recipe is for you. It’s healing for your gut. 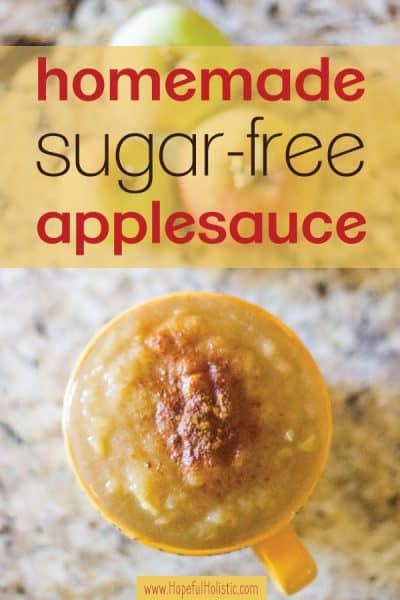 With this applesauce recipe, no sugar is added so it’s healthier for you. But beyond that, did you know that applesauce can help to heal your gut and support digestion? Read on to find out how to make homemade applesauce so that it can be a beneficial part of a leaky gut diet! You can flavor it however you want. Not a fan of cinnamon? Leave it out! Love ginger? Dump a ton in there! You can make your homemade applesauce chunky, or blend it til it’s smooth. You can also add chai flavorings to make it deliciously fall-flavored. It lasts forever. Ok, maybe not forever, but it’s easy to freeze or can your homemade applesauce to store it for up to three years! Skip to the bottom of this post for tips on storing homemade applesauce. One of the best things about homemade applesauce? No sugar. When you eat it, you’re just getting the pure benefits of delicious apples. And yet it’s still sweet tasting! I enjoy having homemade applesauce on top of my fluffy gluten-free biscuits, especially when it’s all warmed up. Mmmm. Apples are also high in vitamin C, which is an antioxidant. Along with other antioxidants in apples known as flavonoids, apples can reduce the damage done by free radicals to your body. Vitamin C also reduces your risk of some diseases and chronic illness. One of the greatest benefits of eating homemade applesauce, however, is found in the pectin. Pectin is a polysaccharide (a type of carbohydrate) that can be found in the cell walls of different plants. It’s beneficial for lowering cholesterol, reduces cancer risk, and supports gut health– more on that in the next section. The problem is that pectin is hard for your intestines to digest. It’s broken down somewhat as the fruit ripens and softens, but it’s still hard for your gut to get the nutrients out of pectin. This is where applesauce comes in! Besides being super tasty and wonderful, homemade applesauce is also beneficial to a leaky gut diet because of the pectin. 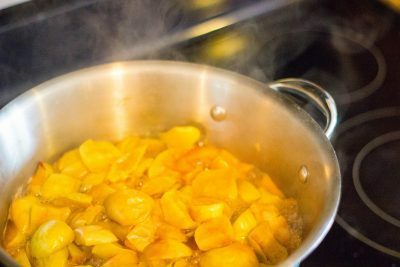 Pectin is released when the apples are heated and the skin begins to shine. How does this help your gut? First off, cooking the apples helps to break them down and pre-digest them for you, making them easy on your gut. An inflamed, leaky gut is sensitive, and having foods that are easy to break down and digest gives your gut a rest and helps it heal. The pectin in apple skins feeds the beneficial bacteria in your gut, and it accounts for around 50% of an apple’s fiber content. It helps keep you feeling full and supports gut healing! If you’re interested in another prebiotic-rich food that helps you stay satiated, check out my root coffee (coffee substitute) recipe! Apples are also anti-inflammatory, which further helps to support the gut. And they have polyphenol antioxidants, which, along with the pectin, supports digestive health. Just one spoonful of applesauce per day can help heal a leaky gut and makes a great part of a leaky gut diet! Depending on your tastes, you can use pretty much any type of apple for making homemade applesauce. Most people prefer slightly sweeter, red apples, but the process of making applesauce also makes the apples taste sweeter. You’ll want to use organic apples for the greatest flavor and health benefits. Ripe apples are best, but it doesn’t matter if the apples are slightly bruised. This is a great way to use up apples that aren’t perfect or optimal for eating fresh, since you’ll be blending them up anyway! Also, apples that are more mealy instead of crisp and crunchy might be slightly harder to blend well. I’ve found that mealy, slightly overripe apples blend up super smooth, but for some reason, the skins don’t get mixed in as well. It doesn’t bug me, but if you don’t want as many skins and prefer smooth applesauce instead of chunky, you should go for apples that are still crisp. You can also strain your applesauce through a coarse strainer for a smoother applesauce. Thankfully, applesauce is both easy to make and doesn’t need many supplies to do it! All you’ll need is a knife and good surface for cutting up apples, a pot with a lid, and an immersion blender. This is the immersion blender I use and I love it! It gets the job done quickly and there are two different speeds- but both are high-powered! You can use it to make both smooth and chunky applesauce. I also use it all the time for soups and mashed (cauliflower) potatoes, and you can even use the whisk attachment to quickly make a couple servings of whipped cream! Yeah. My immersion blender is a staple in the kitchen. If you don’t have an immersion blender, you can process the cooked apples with a blender. You might not have room to blend all of it at once, but a blender works in a pinch. You’ll also need wide-mouthed jars or something for storing your applesauce- just in case you don’t eat it all as soon as you make it! The first time my hubs made applesauce, he spent about an hour cutting up apples. We had a ton of tiny apples from cleaning off a neighbor’s apple tree, and it took a super long time to quarter and get the seeds out of enough apples to fill up a pot. Just in case you didn’t know, there’s a much faster way to do it! Instead of quartering the apple first, just cut around the seeds (see picture below), turning the apple 90 degrees each time, so that you’re left with a square core. 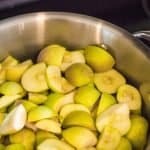 The first piece you cut off will be the largest, and you might need to cut it in half depending on the size of the apple so that your applesauce cooks evenly. 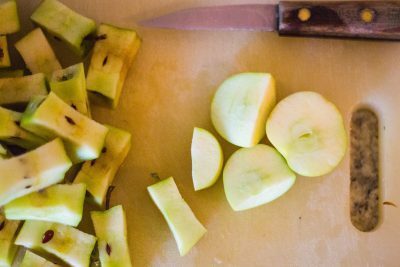 This is the quickest way to cut apples for applesauce! Wash apples, or soak apples in water with one tbs white vinegar for at least 5 minutes (this reduces the molds and bacteria that could be on the skin). Cut up all apples using the method above. Add cinnamon and other spices, mix. Shiny apple skins- ready for blending! Turn off heat and blend applesauce with an immersion blender. You can let the apples cool first if desired. Sometimes the immersion blender might splash and the apples are hot when they’re first done. Eat immediately or store your applesauce to enjoy later! Applesauce is delicious and so easy to make yourself. Enjoy this yummy, gut-healthy snack that you can make in less than half an hour! A note on making applesauce for baby food- you’ll want to blend the applesauce until it’s completely smooth. Chunky applesauce it might be hard for babies to eat and the skins could be a choking hazard. If your applesauce is still too chunky after blending it, you can try putting it through your blender, or just strain it with a coarse strainer. For babies that are just starting to be introduced to solid foods, try making plain applesauce, without cinnamon or any other flavors. This is one baby food that you’ll want to share with your baby! Luckily, storing applesauce is easy peasy. The easiest way to go about storing homemade applesauce is to put it in quart jars and refrigerate. Refrigerated applesauce will be good for about two weeks. If you want it to last longer, you can also try freezing your applesauce. Let the applesauce cool to room temperature before putting it in jars, and leave about an inch of room at the top if you’re going to freeze it. To thaw your applesauce after it’s been frozen, leave it in the fridge or out on the counter overnight. You can also put the jar into warm water to help it thaw faster. Reheat in a saucepan if you’d like to eat it hot (microwaving food decrease the available nutrients). If you’re like me and don’t usually have much freezer room to spare, you can also easily can applesauce so that it can be stored at room temperature! Once you’ve made your applesauce, canning it is easy! This is a simple method for storing homemade applesauce that won’t take up room in your fridge or freezer, and lasts for years! Fill quart jars with applesauce and put new lids on them. Tighten the lids until they’re closed, but not quite as tight as you can. Once the water is boiling, turn the heat down to medium-high (enough to keep the water boiling but not so hard that the jars are knocking around) and set a timer for 30 minutes (45 minutes if you’re at high altitude). Take the jars out of the water with canning tongs and leave them at room temperature until the lids pop (if any lids don’t pop, you’ll need to eat or freeze those). Store your canned applesauce in a pantry or cool area for up to three years. That’s it! Now go out, hunt down some apples, and try making your own homemade applesauce! If you’d like some more yummy recipes that don’t use any sugar, make sure to check out my butter pecan ice cream recipe, 25 recipes with hidden veggies, and how to make your own almond milk at home! (I enjoy using homemade almond milk in my delish natural coffee substitute). These are all great recipes to help you cut down on your sugar intake and eat more healthfully without sacrificing taste! If you have any questions about making applesauce, please comment below and I’ll do my best to answer! Very comprehensive post here! I didn’t know about the benefits of pectin or using vinegar to kill bacteria and mould on the apple skin. Aw thanks! I’m glad you were able to learn something new. I especially love using vinegar on berries because it makes them last longer!